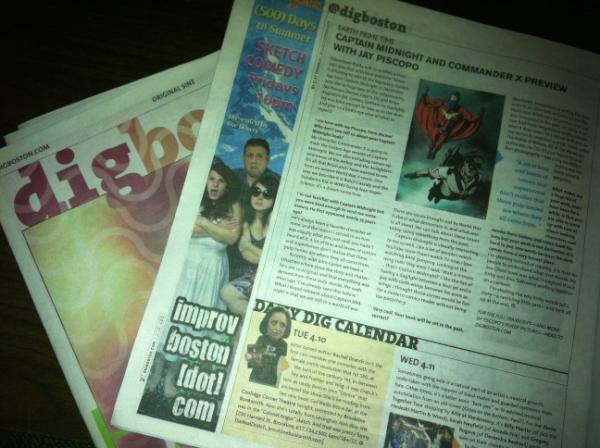 EARTH PRIME TIME: Hits the DigBoston Paper, BABY! First ‘print’ interview / CROSS POST for EARTH PRIME TIME: CAPTAIN MIDNIGHT & COMMANDER X PREVIEW WITH JAY PISCOPO! We made the paper, baby! Thanks for all of the support from my editors David Day and Lauren Metter at DigBoston. Moonstone Books will co-publish a cross-over one shot with local publisher Nemo Publishing to rebirth the legendary golden age hero Captain Midnight in December 2012. We’re huge fans of the collaborators, Jay Piscopo (Nemo, Capt’n Eli) and Brian Augustyn (DC Comics, Gotham by Gaslight). Jay was kind enough to take us to the skies and give us a birds-eye view of what to expect!